ww2dbaseOtto Abetz was born in Schwetzingen, Baden-Württemberg, Germany. His interest in French culture began at a young age, and in his twenties, he found the Sohlberg Circle, a Franco-German cultural group for youths. In 1932, he married a French woman, Susanne de Bruyker. In 1934, the Sohlberg Circle became the Franco-German Committee (Comité France-Allemagne), which included Pierre Drieu la Rochelle and Jacques Benoist-Mechin. Although his political views leaned to the left, he joined the Nazi Party in 1937. In the same year, he applied for the German Foreign Service. In 1938, he attended the Munich Conference as a staff member. In Jun 1939, he was deported from France after being accused of bribing two French newspaper editors to write pro-German articles. In 1939, he was among Adolf Hitler's staff when the German leader toured recently-conquered city of Warsaw, Poland. In Jun 1940, he was assigned to the German Embassy in Paris, France, where he was given the task by Joachim von Ribbentrop to seize various pieces of art. In Nov 1940, he was named the head diplomat to France; he did not receive the title of ambassador for that the French government officially ceased to exist in France. In addition to being the liaison between the French civilian agencies and the German occupation government, he was also in charge of dealings with Vichy-France. In late 1940, he established the German Institute to introduce German culture to the French, which offered German language courses (which was attended by 30,000 people) and concert events. In May 1941, he negotiated the Paris Protocols to expand German access to French military facilities. Additionally, he also had heavy influence over the direction of art, culture, and propaganda in occupied France. In Jan 1942, he was given the honorary rank of Brigadeführer in the Schutzstaffel (SS). In late 1942, after German occupation of Vichy-France, the German military took direct control, and Abetz was recalled from his position, though remaining in France until Sep 1944 when the German troops withdrew from Paris. After the war, he was captured by Allied authorities in Baden-Württemberg. 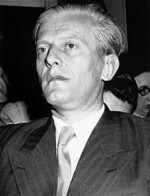 In Jul 1949, he was sentenced by a French court to 20 years imprisonment for war crimes, particularly for his role in the deportation of French Jews to concentration camps. He was imprisoned from 1949 to 17 Apr 1954. He passed away on 5 May 1958 in an automobile accident near Langenfeld on the Cologne-Ruhr autobahn in Germany. 26 May 1903 Otto Abetz was born. 5 May 1958 Otto Abetz passed away. Once a Fascist always a Fascist. Fits Abbott's mob like a glove.